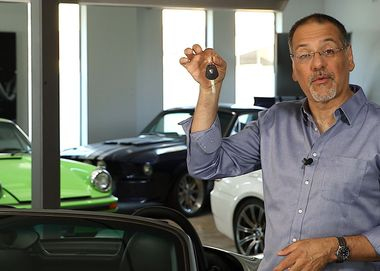 A new article and video on Cnet has surfaced in an attempt to forecast the end of mechanical car keys. As a locksmith, who has worked in the key and access control industry for over 30 years, both stateside and internationally, I have heard similar tired stories of the end of the auto car key, yet they are still here and while they are indeed becoming fewer, across more modern vehicles, they are a long way from being eliminated. In fact, manufacturers still produce some vehicles using mechanical car keys because it is actually cheaper, longer lasting and better quality with less issues than nouveau app controlled access control components. About 25 years ago, the first iterations of "chip" keys or "transponder" keys began to surface in an attempt by automobile manufacturers to "better secure" vehicles. A couple of days ago, a returning customer (we love these), requested to install a lockable knob to an office door at their home. The particular door had about a 45 year old Schlage Privacy Knobset with a 5 inch (127mm) latch backset mechanism. The knob was in the color US26D or Satin Chrome (Nickel). To measure the latch backset on your door, measure the distance between the edge of the door and the center of the handle. Now, finding an identical replacement entrance set would have been a time consuming chore, especially considering many manufacturers do not make 5" (127mm) latch backset mechanisms anymore. The standard residential latch backset mechanism in America is 2-3/8" (60mm), while the standard commercial latch backset mechanism in America is 2-3/4" (70mm). Luckily for us, as the North American distributor for the fabulous Serrature Meroni lock products, we keep a number of their unique handle and door hardware products in stock. All the door handles in this beautiful home are in US26D (Satin Chrome) and we needed to be sure to provide a suitable entrance set that matched the interior decor of the house. After removing the old lock and mechanism we replaced the latch mechanism with a Meroni 5" (127mm) latch backset mechanism. Image 7 shows the Meroni Nova N13 Entrance set, as it looks from inside. A turnbutton for inside use and key operated on the outside. Image 8 displays how beautifully the Meroni Nova N13, matches the decor of the house. 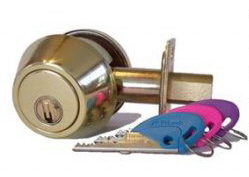 The lock is simple to operate and has no turning method. You simply push the button to operate the mechanism. The broad color options of Meroni Doorware pleases discerning home owners and interior designers, wishing to match their doorware to color schemes of their homes. Quite simple to install and operate, these products have been in the North American market about 20 years and enjoy great longevity because of their quality. One extra benefit to using any of the range of Meroni doorware is the ease of use, especially for arthritis suffers or the physically challenged. Competitively priced and user friendly, Meroni doorware offers customers nouveau - modern, aesthetically pleasing hardware to complement virtually any decor. Available exclusively from Master Key Systems America LLC. 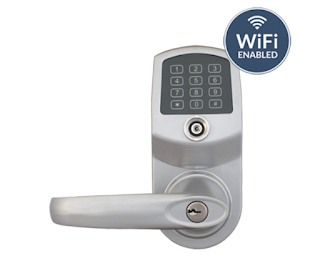 A recent article in TechCrunch has highlighted one of the many pitfalls of modern day WiFi connected access control door locks. Apparently, the modern AirB&B "sharing economy" room for let company has been recommending the product pictured here by Lockstate, a manufacturer of modern day WiFi enabled entry locksets and deadbolts, for use with AirB&B's Host Assist program. This is the program recommended by AirB&B for their vendors to use for door entry. We have been discussing many different manufacturers of digital and electronic door locks, for a number of years now and we have found that a great many of the marketed products appear to suffer from significant issues, especially relating to ease of use and longevity. But this issue, as brought up in the recent TechCrunch article shows a vulnerability that many vendors/hosts or even home owners may not be aware of. While the desire to have and use a modern day easy to operate access control system is growing in popularity, pitfalls are constantly being discovered that are hampering the technology from seeing wide spread adoption. The issue with this company, relates to an OTA (Over The Air) OS (Operating System) update that effectively locked out guests, management, cleaners and users of AirB&B short term rentals. Customers were locked out of their "hotel" and hosts were required to unlock manually and provide operating door keys to customers. Now, some people will think that this is just a temporary inconvenience and simply write it off as "luck of the draw", but in any business today, maintaining accurate and effective and operational access control is of paramount importance to a continuing operation. Other issues would be purchasers may not be aware of include, power-drain, where AA batteries require constant replacement (sometimes 3-4 times a month), weather affected installation, where use on an outside door that is exposed to weather affects the internal wiring of components and causes frequent operating issues, natural weathering, where mother nature causes the ground to shift (slightly) and wooden door frames and doors will naturally move, often causing doors to bind and not close or open easily and more importantly, not sufficiently secure an entry door because the bolt/latch, just refuses to align correctly with the strike plate/catch. 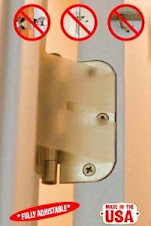 Another issue, rarely discussed or even pointed out by salespeople and installers is the height of the door lock. In America, the IBC (International Building Code) indicates that the suitable height of a door knob/lever, is between 36 and 40 inches from the floor. Generally, this height is too low because the average height of men and women in America is 5'10" tall. The average height of your typical deadbolt lock on your entry door will be about elbow height on a 6' tall person. That is 5-1/4" above the typical height of the average door knob/lever. The issue with door knob height, explains in part why many door knobs and levers tend to come loose, while the actual door will move in its frame because people are literally pressing down while turning the knob or lever. This completely natural action is virtually unnoticed by most door knob/lever users. This direct action contributes to one of the locksmith and door repair industries, most common called for repair projects, across the entire world. The most common fix/repair for a typical "door dropped" issue, is to simply replace the screws in the top hinge with 3" screws. Often, this will attach the hinge, through the frame to the stud. By attaching the door to the stud, the likelihood of "door dropping" and "weathering" and "door not latching or locking" issues goes away. Your cost? Maybe $3 in screws. 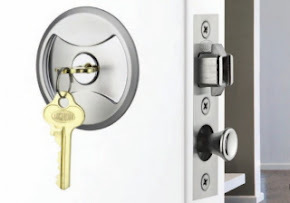 As professional locksmiths and door repair specialists, we here at Master Key Systems America LLC are available to consult and advise, methods and products that may help you to enjoy long term use of your door locks, hardware and security products. Our office is conveniently located, ensuring prompt response. Our service vehicle is well equipped, meaning we can get the job done quickly and efficiently. Master Key Systems America is backed by more than 30 years of locksmith experience. 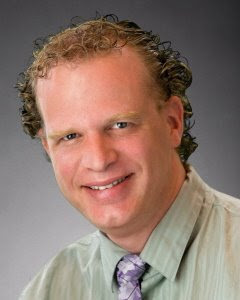 We carry professional liability insurance to give you the peace of mind that your interests are covered. Our very popular Lockwood 7444 Keyed Pocket Door Lock, that we have been selling for about 7 years now, is flying off the shelves right now. The video below shows how easily installed it is. Currently they sell for $128.00 plus shipping, but because the US Dollar has weakened compared to the Aussie Dollar, it is very likely we will see a price rise with the next batch. If youre sitting on the fence, consider purchasing now before the price rises.